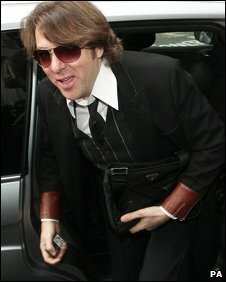 More than five million viewers tuned in to watch Jonathan Ross's return to TV following his three-month suspension by the BBC, early figures show. At its peak, 5.1m people saw the star interview Hollywood actor Tom Cruise on Friday Night with Jonathan Ross. Ross's last chat show in October before his suspension was watched by 3.74m. Meanwhile, the star said it was "very nice to be back" as he returned to his Saturday morning Radio 2 show after the Andrew Sachs lewd phone call row. Ross resumed hosting his BBC One chat show on Friday with the words: "So, where were we?" and apologised again for the incident. He added: "Welcome to our millions of regular viewers and to our several thousand new viewers who I suspect may be watching for the very first time." Speaking on his radio show about his TV return, Ross said: "It was nice to be able to go out at the beginning and say sorry to people because I said sorry beforehand, but that message didn't seem to have got out there. "I got the feeling the newspapers hadn't actually heard it, even though some of them printed it, so it was nice to go out there and get the chance to get that off my chest," he added. During the show, the star said it felt "peculiar" not working over Christmas and thanked the presenters who sat in for him while he was away. Ross was joined in the studio by presenter Graham Norton, comedian Katy Brand and Mercury Music Prize winners, Elbow. On his TV show, the presenter told the audience it was "a great privilege" to be "allowed this level of freedom to communicate", adding he would be "more aware of the responsibility" now. "But, as the kids say, it was 'my bad' so I do apologise for any hurt or distress it’s caused," he said. The BBC received 25 complaints on Friday from viewers unhappy at Ross's return to the BBC and three messages in support for the presenter. After more than 42,000 people complained, BBC bosses carried out a review and suspended Ross without pay for three months.